As the rain falls and the water runs down the hills erosion takes place, nutrients are washed away and ultimately you can end up with bare soil that gets cooked during the hot summer months, killing microorganisms and plants, decreasing the absorption capacity of the soil. Apart from all of this, most of the water that will run down your hills will be completely wasted running off your property to never come back. How can one then catch all this water and use it without having to invest a lot of money and using a lot of space? that answer is very simple, by storing the water in the soil with the help of swales. 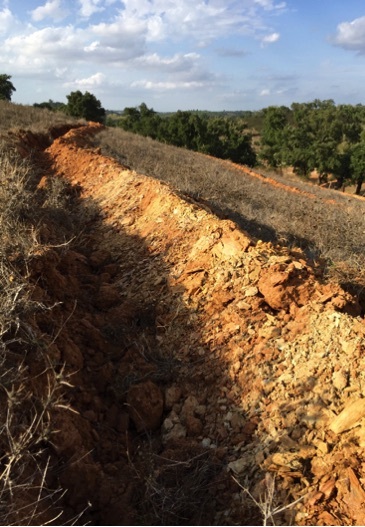 Is a trench made on contour (horizontal line without inclination up or down) where all the soil that is taken out of the soil is placed immediately after the hole downhill. 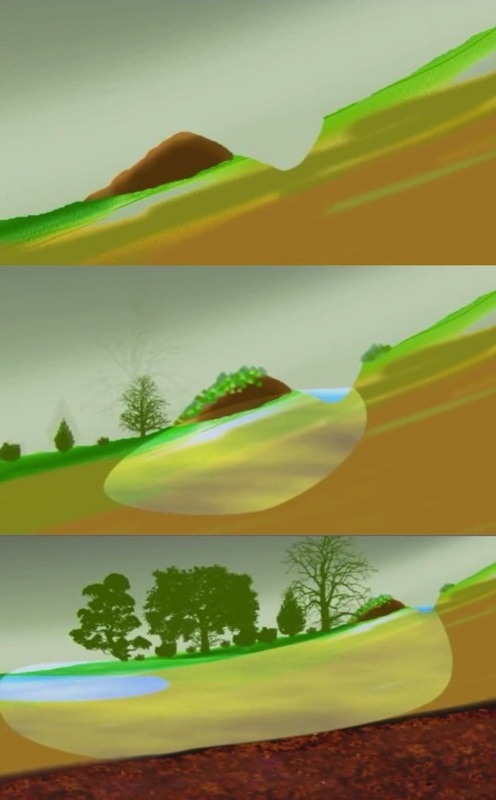 The idea is that the rain that falls and fills the trench will infiltrate and “drain” into the soil, filling up the hill with water that will travel downwards at a 1000 times slower rate than it would on the surface. That water is not really retained, it will still travel out of the property at the end, but in the process it will fill up and raise the water table feed the trees and plants for al lot longer than it would otherwise. If you have a well or a pond under swales, it is very probable that they too will be refilled from underneath by the water that sinks through the swales. We have studied a few ways of making swales. The techniques we have seen being used by experts seemed very interesting but also very expensive, normally digging out the trenches with an excavator preferably with one that can tilt the bucket 45° sideways since it can dig at the right angle in one go (as long as the machine is well position on the land and there are no obstacles), which we couldn’t find on this part of Portugal. The hour of a 24 ton excavator is about 65€/hr and a smaller regular “digger” is 35€/hr. We asked a few machine operators how long the thought it will take to dig a 100m swale of 50 cm deep on perfect contour. It was hard for them to estimate since they were not familiar with the job and they thought it could take something about about a day’s work the 24 ton one and even more with the small one. Our land is 15.7 hectare (38.8 Acre) and most of it is quite hilly. There is about 3 km of swale line that we wanted to do and with that technique it would have costed a fortune . As mentioned, the operators had no experience in making swales before wich made the whole thing very uncertain. There had to be another way. 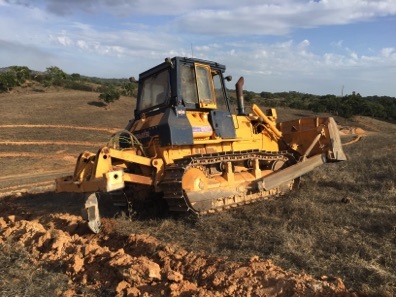 After discussing the issue with a very gifted excavator operator, now a good friend, he said that since a few years they started making trenches for planting Eucaliptus using a tractor with a big plough and placing the trees directly in the trenches with good results. They normally don’t really spend to much time marking the swales making sure they’re on contour but eucalyptus is a very tough tree that requires very little care if any at all. In our case is different, we want to optimise water infiltration into the soil and we want to grow many nice, fruit giving species that do need care and water. 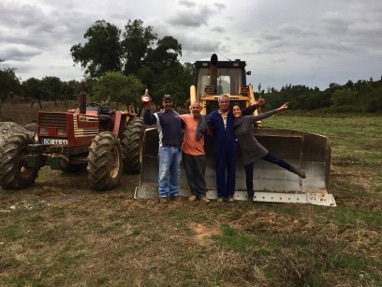 We decided that in order to improve the drainage of the swales we could first drive a bulldozer with a “reaper” on the back (a 1 meter long sharp piece of metal) penetrating deep into the hill, breaking stones and rocks on its ways, making it easier for the water to sip down. 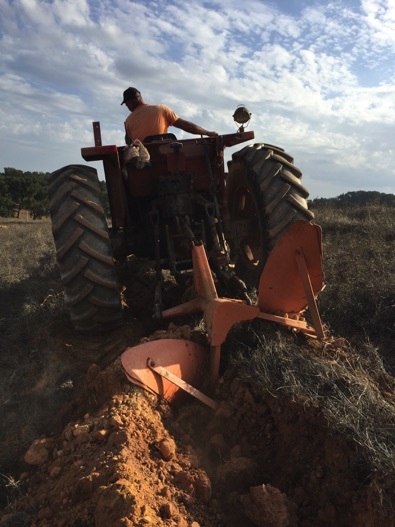 afterwards on the already marked lines the tractor could drive, ploughing easier and deeper, using only on side of the plough (see pic) pushing the earth to only one side. 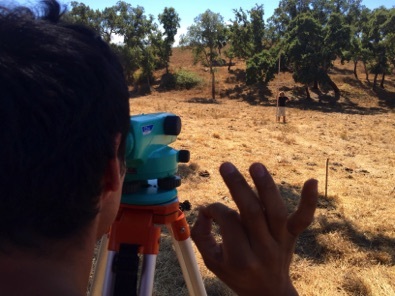 We marked the Swales using a geodetic devise, a big ruler and a lot of cana sticks (the portuguese version of bamboo) that we had left over from a toilette that we made. It took a lot longer to mark the swales than to dig them. We put a pin every 8 steps more or less and 5 steps where there were ridges since the machines would have to do sharper, more detailed curves. It took 3 of us (one spotter, one holding the big ruler and one making holes and putting in the cana marks) about 4 days to mark the swales in most of the property. It took about 5 hours for the machines to make the swales. We didn’t really measure their length but we estimate that all put in a line would be about 3 km. 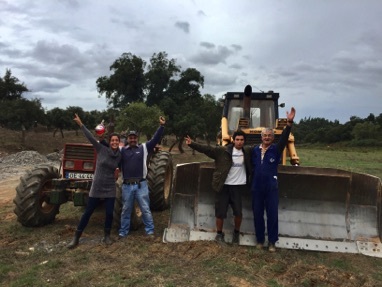 The price for the bulldozer is 75€/hour and the tractor 25€/hour. A few tips: It is important to guide the bulldozer driver as the reaper sits in the back and he can’t really see where he is making the line. After a while though he got a very good feeling and the lines were made very accurately. Another thing is if your going to use this technique you can ask the tractor driver to show up later or next day since it is way faster than the bulldozer so you can pay less tractor hours. After finishing the swales we planted (tossed seeds) lupin on them to fix nitrogen and strengthen the swales and they started sprouting a week ago all over them. It is impressive to see them grow even on the rockiest parts of the hills. It is recommended to mulch the swales but it would be just to much material to cover them all. We’ll keep adding nitrogen fixing plants and bushes such as medronheiros (strawberry bush) and different kinds of fruit trees. 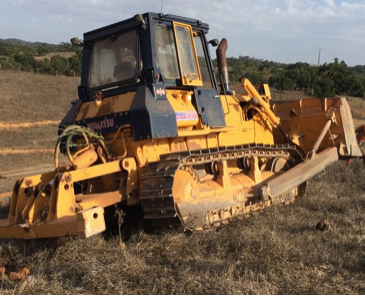 On the hills where there are many trees we didn’t make swales since the machines couldn’t pass, and the difference is very noticeable, still looking brownish where the swaled ones are full of small plants after only a few rains. It feels great knowing that one’s land is being hydrated and life is flourishing.